Deliver faster, smarter marketing: Built-in intelligence automatically surfaces your most valuable marketing insights so you can act quickly to achieve your goals. Gain more control over your investments: Easily see what parts of your marketing are working and make informed decisions to improve performance–ensuring that you’re delivering quality experiences. Understand your audience on a deeper level: Easily integrate and access your data to gain a deeper understanding of your customers and identify your most valuable audiences. Share insights across your team: Make information and insights accessible to your entire enterprise so teams can work better together. 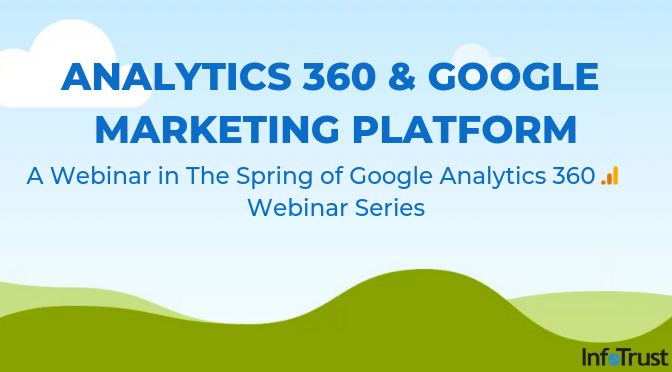 We’ll also dive deep into Analytics 360–part of the Google Marketing Platform. Analytics 360 allows your team to unlock new insights, connect insights to results, and make your data work. Join InfoTrust’s Amin Shawki on May 23 at 1 PM EDT to learn more! © InfoTrust LLC. All Rights Reserved.